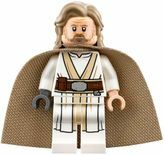 Luke Skywalker is a minifigure from the Star Wars line. He based on one of the main characters from the Original Trilogy. The Tatooine Luke Skywalker variants are based on Luke wearing his farming clothes when he was on Tatooine, which he wore during most of Star Wars: Episode IV A New Hope. The 1999 version of the Tatooine Luke was first released in the set 7110 Landspeeder, which was a part of the first ever wave of Star Wars sets. This version of Luke has a tan-coloured hairpiece with a yellow head. The head has black printing for the eyes and mouth, and has a neutral expression overall. The torso piece is white with yellow hands, and has printing on the front- a brown belt with a silver buckle and other attachments, a yellow neck at the top of the piece, black outlining for the neck area and the join of the shirt with a dashed grey line underneath the join, and other grey marks in four places for creases. The legs are tan-coloured with a white leg joint. The legs feature white printing at the top for the continuation of the shirt with a grey crease on each leg, and outlining for the shirt's join on the right leg, continuing on from the torso. Underneath this area around the knees on each leg is a a rectangular area outlined in black, with several black lines inside each box. In 4501 Mos Eisley Cantina, Luke comes with an accessory- a blue-bladed lightsaber. Luke's second Tatooine variant came in 2007, with the release of the 10179 Ultimate Collector's Millennium Falcon. This version of the Tatooine Luke retained most of the features as the original, but featured some differences such as the belt's buckle being made a square shaped and moved over slightly to the left-hand side. The belt itself was widened and changed to reddish brown, and features a utility pouch on the right. The creases in Luke's tunic in this variant are made up of single curved grey lines, going in a generally vertical direction. The back of the torso is once again unprinted, but the hands were changed from yellow to a flesh colour, reflecting the decision to change the skin tone in licensed minifigures from yellow to a more realistic tone. The leg printing in this variant also features the bottom of Luke's tunic, with the edges outlined in black. Dark tan lines are printed below the tunic, representing wrinkles in Luke's trousers. Luke's head piece is flesh-coloured, and features black dot eyes, a straight black mouth, and brown eyebrows. The hairpiece used for this variant is parted at the middle, and the hair falls down to the bottom of the head piece at the sides and back. This variant of Luke does not come with any accessories. The next version of a Tatooine Luke was released in 2010, and is exclusive to 8092 Luke's Landspeeder. This variant retains the same hair, body and legs as the 2007 version, but features a different head piece. The head's printing features a black mouth with a slight smile, a darker flesh line for detailing the chin, white pupils inside the black dot eyes, and brown eyebrows. 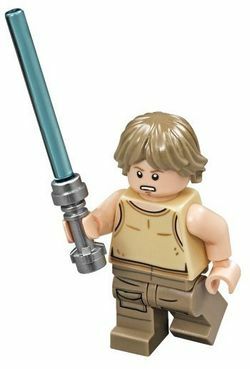 The 2010 Tatooine Luke comes armed with a blue-bladed lightsaber. The following year, another variant of Luke in his Tatooine clothing was released, which was made for 7965 Millennium Falcon. This one again kept the same body and legs first introduced in 2007, however the head and hair was changed. The head piece is double-sided; one side has Luke with black dot eyes with white pupils, a dark flesh mark for the chin, downturned black mouth and downturned brown eyebrows, giving an overall angry or determined expression. The other side of Luke's head has a black open mouth with a grey visor outlined in black over the eye area. The face is to be used in conjection with a helmet, to represent the helmet's blast shield down, covering the eyes. This version of Luke also comes with a new tan hairpiece, which has a more untidy look to it than previous hairpieces used. In addition to the helmet, this variant of Luke comes with a blue-bladed lightsaber. In 2012, another variant of Tatooine Luke was released, exclusive to the New York Comic-Con set, Luke Skywalker's Mini Landspeeder. This variant is identical to the 2010 variant, but features the hairpiece first used on the 2011 one. In this set, Luke came with some dark grey macrobinoculars. In 2014, two variants of the Tatooine Luke Skywalker were released. The first was an update on the previous variants, retaining the same hair as the 2012 variant, but featured changes in all other pieces. The printing on the front of the torso piece featured some changes, including the belt buckle being changed back to a rounded rectangle, and being moved slightly closer to the centre of the belt. The utility pouch on the belt was also made slightly smaller, and the lines for the creases in the tunic were made thinner and less obvious along with some of the creases being repositioned. This version of the Tatooine Luke is also the first to feature back printing, which consists of the back of the belt with two rectangular utility pouches on the left-hand side of the belt, and one pouch on the right. Some creases in the tunic are also present around the belt area, as well as a black curved line at the top of the piece, representing the top of the tunic. This variant's leg piece is white as opposed to tan, and features black printing outlining the bottom of the tunic, and tan outlining underneath for the trousers. Luke's head for this variant is double-sided. Each side features a face with dark flesh printing for the chin and cheekbones, dark tan eyebrows and black eyes with white pupils. However, one side of the head has the eyebrows slightly downturned with a black downturned mouth for a serious expression, while the other has more neutral eyebrows and a lopsided while smile outlined in black. For each of the three sets this variant appears in, Luke comes armed with his blue-bladed lightsaber. The second variant released in 2014 was for the book 5004195 LEGO Star Wars: The Visual Dictionary: Updated and Expanded. This variant of Luke is based on the original Tatooine Luke Skywalker released in 1999 with yellow skin. However, there are some slight differences, the most obvious being a larger belt buckle and minor changes in the creasing pattern of the tunic. In 2008, a Luke Skywalker in a stormtrooper disguise was released for the 10188 Death Star. This minifigure has the body and legs of a normal stormtrooper- white legs with a black hip joint, and a white torso with black hands. Black and grey printing is also present on the front and back of the torso for outlining of the armour, belt, backplate and thermal detonator. The head and hair piece is the same as the one used on Luke's 2007 Tatooine variant. This version of Luke has two accessories- a black blaster and a stormtrooper helmet which can be switched out for his hair. Pilot variants of Luke are based on his Rebel Alliance flight suit that he wore when piloting his X-wing or snowspeeder, a suit he wore in both Episode IV A New Hope and Episode V The Empire Strikes Back. The first pilot version of Luke was released in 1999 the first year of Star Wars LEGO. This minifigure has plain orange legs with a dark grey leg joint. The torso piece is also orange, with black hands for gloves. Grey, dark grey, black and metallic printing is used on the centre of the torso piece for the vest and control panel which is worn over the orange flight suit. Luke's yellow head piece is identical to his original Tatooine variant, and in place of hair, he wears his personal Rebel helmet. This helmet is white, and features a red line in in the centre with a red Alliance Starbird to each side. At the front of the helmet is a yellow rectangle with three black diagonal lines. In addition the the helmet, Luke comes armed with his blue-bladed ligthsaber in all three sets that this variant appears in. In 2004, another variant of the pilot Luke was released. The only change in this Luke and the original is that the grey and dark grey areas were changed to slightly different shades, reflecting the change in LEGO's colour palette. This variant of Luke again comes with a blue-bladed lightsaber. 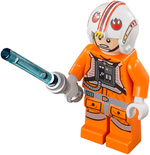 The 2006 version of Luke as a Rebel pilot retained the body and legs of the 2004 version but had a flesh-coloured head, the same one which was used on his 2007 Tatooine variant. Luke's helmet was also slightly updated, with the main difference being that the black lines on the front of the helmet were lengthened. This version of Luke again comes with a blue-bladed lightsaber for every set it appears in. Luke Skywalker was the son of the former Queen and Senator of Naboo, Padmé Amidala, and Jedi Knight Anakin Skywalker, and twin brother of Leia. When his mother died after giving birth to him and Leia, Jedi Master Obi-Wan Kenobi took Luke to the remote world of Tatooine to hide him from his father, who had turned to the Dark Side and become the Sith Lord Darth Vader. For the next nineteen years of his life, Luke lived and grew up on his Uncle Owen Lars' and Aunt Beru's moisture farm. He owned a landspeeder, and was known to have raced T-16 Skyhoppers with his best friend Biggs Darklighter. One day, Luke his uncle purchased two droids, R2-D2, and C-3PO to help out on the farm. After Owen and Beru were killed by the Empire's Stormtroopers, he went with former Jedi Master Obi-Wan Kenobi - who told him his father was a Jedi Knight, and gave him his father's lightsaber. After Obi-Wan's's death at the hands of Luke's father Darth Vader, Luke helped destroy the Death Star, with the help of Han Solo, Chewbacca, Princess Leia, R2-D2,C-3PO, and all of the rebel alliance in the battle of Yavin and became a known leader in the rebel alliance. He then helped in the battle of Hoth but the Empire forces outmatched the rebels and the rebels scattered across the galaxy, eager to escape the Empire's attack. He flew to Dagobah and was trained by Jedi Master Yoda. His training was interrupted when Luke sets off to Bespin to save his friends, and Han Solo was frozen in carbonite. When dueling with Darth Vader, the Sith Lord cut off Luke's right hand, and he lost his lightsaber along with it. It was then that Darth Vader revealed to Luke that he was his father. Luke escaped, and after going to other adventures, he created his own green lightsaber. He went back to Tatooine to save Han Solo from the hands of Jabba the Hutt. Eventually, Luke visited Yoda on Dagobah again but whilst there, Yoda died of old age. Soon Luke dueled his father again on the second Death Star above the forest moon of Endor, and though he defeated him, he refused to finish him off, knowing it would turn him to the dark side. The furious Emperor Palpatine unleashed his force lightning upon Luke. Because of this, his father came back to the light side and threw Palpatine into the core of the Death Star, killing him and saving Luke. However, Anakin's suit was badly damaged by the force lightning of the Dark Lord and he soon died in Luke's hands. Luke burned his father's remains in a fire in a Jedi tradition, but later saw Obi-Wan, Yoda, and his redeemed father Anakin Skywalker as Force spirits. In the Star Wars films, Luke Skywalker was played primarily by Mark Hamill, who also voiced Von Nebula and Black Phantom in Hero Factory: Rise of the Rookies, and Sinestro and the Trickster in LEGO DC Comics Super Heroes - Justice League: Attack of the Legion of Doom! 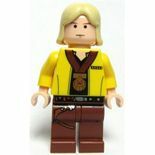 Luke makes a cameo in LEGO Indiana Jones: The Original Adventures where he is one of five characters hidden throughout the game which must be found to unlock Han Solo. In LEGO Star Wars: The Video Game and LEGO Star Wars II: The Original Trilogy Tatooine Luke has a different appearance than any of his physical variants. He has the flesh-tone version of Luke's Return of the Jedi face and hands that became Luke's default face for a time, while his body and legs are the versions from the original Landspeeder set from 1999. Luke's 2013 pilot variant without goggles. Luke from the Desert Skiff. Luke in Lego Star Wars III: The Clone Wars. Luke without the helmet in the Millennium Falcon. This page was last edited on 8 March 2018, at 00:48.